Birthdays are special day to everyone life and this day become more special for us when it’s our younger one’s birthday. We want to make their day memorable. So, we to celebrate it with delicious cake cutting celebration. The cake should be well design in shape, size, texture, good quality and yummy in taste. This is a Perfect gift hamper for your child’s birthday or your wife’s birthday. We are known for best quality assurance and unfailing delivery. 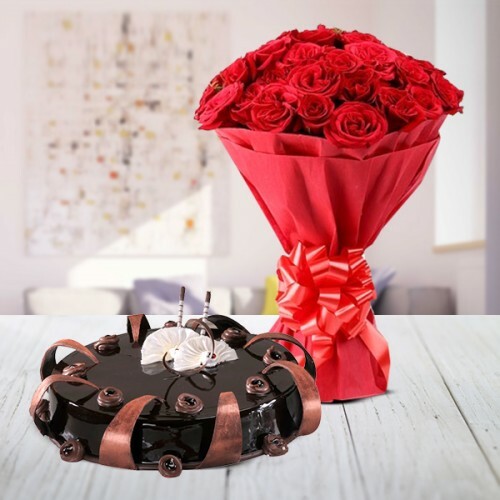 Items: 25 Red roses & 1 Kg specially designed cake. Colour of Flower: Red Roses. Type of Flowers: 25 Red roses wrapped in red paper with white ribbon. Cake: Uniquely designed Macaroon swirl cake (1Kg). Make your younger one’s birthday Special. Gift this wonderful hamper to your wife or fiancé on her birthday. Consume cake within 24 hours from delivery. Change the water of vase or bowl daily. Remove the leaves from stem to maximize the life of the bouquet.